We won’t sugar-coat it; successfully adopting DevOps practices is not easy. Business no longer has months to deliver software, it’s weeks and even days. Meeting customer expectations on time, every time, is a successful DevOps outcome. Planit’s DevOps services, built on decades of successful automation and process expertise, enables customers to improve software quality and deliver product faster. An environment where innovation is encouraged, automation is expected, and continuous improvement is business as usual. Software development requires collaboration where everyone is a stakeholder, with tools to support team visibility and traceability. 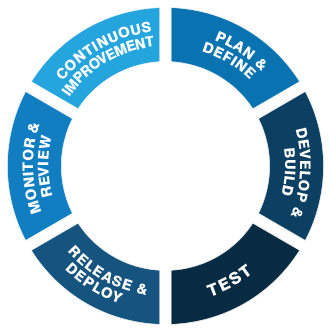 Planit views DevOps in six critical segments. Before embarking on a DevOps journey, it is important to measure current capability in each area and establish or validate a future state. Planning sets the tone for an effective software development lifecycle. Visibility and traceability are key to accurate estimation, which is a catalyst for trust and collaboration. Project team visibility. From stakeholders to release engineers to operations – everyone is a part of the team. Planning is a team effort. Balance exists between business need and technical bandwidth. Each iteration is followed by honest evaluation. What worked, what didn't work, and what can be improved upon. Business requirements are traced to user stories, coding tasks, builds, tests, and deployments. Building quality software starts with standards and well-defined processes. It is critical to automate wherever possible so that developers can focus on developing. Standards and processes define how product is securely built, tested and deployed. They ensure software is maintainable and extendable. Every change is controlled, visible, and traceable throughout the project lifecycle. A practice of workflow that enforces developer collaboration to enable a shift left testing strategy. Fit for purpose tools and frameworks are leveraged to support your requirements, processes and technologies. Product quality is measured almost instantaneously when your test assets support a continuous delivery model. Testing of user stories at the client UI validates the business needs have been met. Testing of the interfaces between system components validates total application integrity. Validates the downstream components of the client app respond within stated response times. Shift left, test early. Use intelligent stubs to validate an application when components are missing. Frequent releases are critical to getting product into the hands of your customer, and the driver of the continuous feedback loop. If the DevOps pipeline is not visible to the team, you are not ready to deploy software. Information is immediately available to the team for issue resolution and process improvement. “It worked in my environment” is not an acceptable statement. Consistent tools and processes are required in the delivery lifecycle. Consistent and repeatable processes enable safe and reliable product deployments. Infrastructure and application monitoring provides performance and early warning indicators, which are critical to protect and improve the customer experience. Continuous monitoring and reporting of infrastructure health enables rapid identification of issues and timely remediation. If it can’t be measured it can’t be improved. Metrics promote learning, repair and prevention. Validate performance of system and application behaviour against required SLAs. Rapid diagnosis, metrics, and performance are the key drivers of a positive customer experience. Continuous improvement is a culture that evolves through successful DevOps implementation. Software must address customer needs while responding to market demand. Mistakes are part of the improvement process, experimentation is encouraged. No band-aids, fixes occur at the source and flow through the product lifecycle. Predictability is achieved through repetition. Planit DPO is a low risk, low cost, high value program that follows a proven process modelled on success. DevOps has been around long enough to show the path is littered with false starts or failure to meet expectations. DPO establishes the right path for a successful DevOps journey. An independent assessment of maturity, capability, readiness and awareness of DevOps practices. DevOps maturity scorecard of current and desired target states, and detailed findings of opportunities and primary barriers to overcome for success. Plan, actions and priorities to achieve the target state, timeline for adoption, and key automation and process enablers. DevOps adoption approaches and efficiencies to be realised. Adopt relevant aspects of the DevOps journey with Planit as your trusted implementation partner. In progressing on their DevOps journey, Organisations often need an experienced partner to implement process change and Agile transformation, deliver end-to-end automation, and enable continuous improvement. Planning sets the tone for an effective software development lifecycle. All stakeholders must participate when prioritising work and planning iterations because value is not realised until product is delivered to the customer. Planit’s DevOps solutions, which include our industry-leading Agile coaching, training and iSQI certifications, help customers organise, collaborate, and more precisely plan and define work. End-to-end automation of the software delivery toolchain is required for DevOps success. Continuous integration and deployment automation reduces risk, saves time and cost of product delivery, and provides team visibility and traceability. Value is achieved when an automated deployment pipeline defines process and enforces a path to production. Planit’s DevOps teams specialise in toolchain implementations, which include best-fit recommendations, configuration, validation, and process adoption. Test automation complements a DevOps CI/CD program by building appropriate tests into each stage of the product lifecycle. A shift-left offering, continuous integration and test optimisation drives a test-early/fail-early/correct immediately set of practices. Quality improvement is enabled when unit, functional and performance tests are part of the defined process, with visible results and gated controls. In a digital first world, Application Performance Management (APM) is vital to protect organisations from unforeseen outages and a poor customer experience. APM enables infrastructure and full-stack application performance monitoring to measure, conduct root cause analysis and resolve problems before the business and customer experience is impacted. Planit’s DevOps specialists provide customers with comprehensive APM solutions, including maturity and capability assessments, APM roadmaps, best-fit tool recommendations, configuration, implementation, validation and adoption. Did you miss our DevOps Toolchain Webinar? This recorded webinar provides a technical demonstration of an integrated DevOps toolchain showing the right type of automation to support DevOps process improvement and cultural transformation.